I’m feeling a little smug this evening. I made a dish last night so despite my best efforts to get out of work at a decent hour (foiled again), I came home to an already-made meal. Yeah! And I was hungry, so forgive the fuzzy photo. This is an almost no cook, mostly assemble dish. In a 3 qt pot, boil 4 cups of water. Add orzo and cook until tender, about 10 minutes. Meanwhile, assemble the olives, garlic, tarragon, lemon juice and pepper. Mix well. As the orzo is done, add the frozen peas to the same pot and let the water return to a boil. Once at boil, remove from heat and drain in a collander. Run cold water over the peas and orzo to stop the pasta from cooking. Drain well. 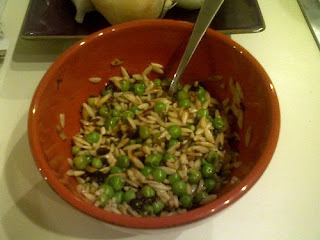 In a large mixing (or serving bowl) drizzle the olive oil over the peas and orzo. Mix gently. Add the olive mixture and fold in gently. Serve warm or chilled.